On April 18th, 2019 Helen: a literary magazine took part of the Poetry Open Mic Night at Green Valley Library. 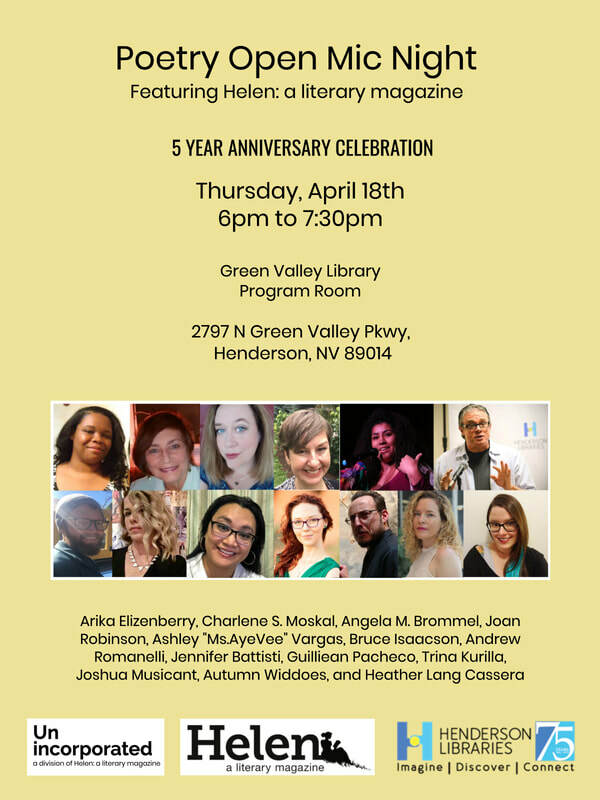 The celebration was part of our anniversary, but also was one of many local events celebrating National Poetry Month in the state of Nevada. We had readers from our issues and staff read first: Arika Elizenberry, Charlene S. Moskal, Angela M. Brommel, Joan Robinson, Ashley "Ms.AyeVee" Vargas, Bruce Isaacson, Andrew Romanelli, Jennifer Battisti, Guilliean Pacheco, Trina Kurilla, Joshua Musicant, Autumn Widdoes, Elizabeth Quiñones-Zaldaña, and Heather Lang Cassera. Emilee Wirshing of the Green Valley Library hosted the event. We featured catering from The Corner Bakery. The second half of the event was open to everyone and we listened and enjoyed many poems from talented poets from Vegas and California. The Poetry Open Mic Night is an ongoing event at the Green Valley Library every third Thursday of the month. Feel free to go and join them and read some poetry.